Spirit of Woodstock Festival 2010 – starting to prepare! Well, it’s about time to start preparing for the ‘Spirit of Woodstock Festival 2010’ where Michel Montecrossa and international guest-bands will play for 10 groovy days. Free Entry!!! Michel Montecrossa and his band the Chosen Few this year bring to the Spirit of Woodstock Festival in Mirapuri the brand new songs of their ‘Happy Future & Climate Change Concert Tour 2010′. 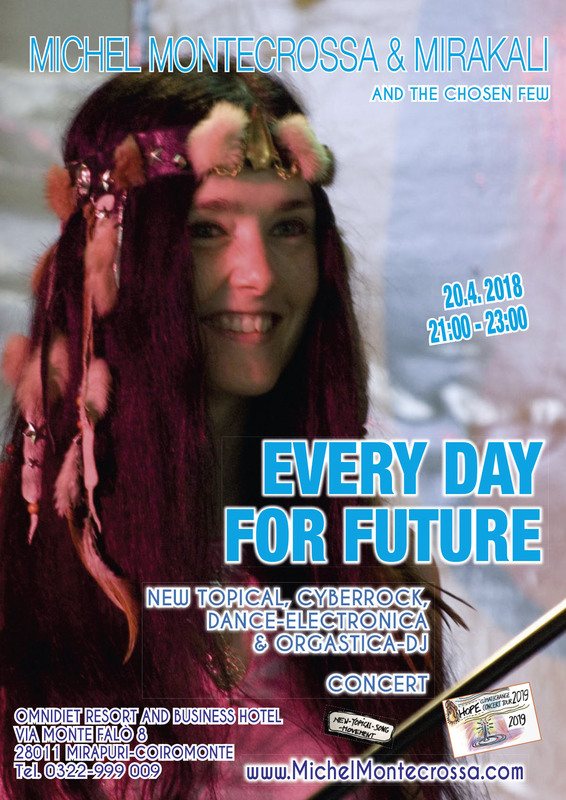 During the ten festival days they present a stunning concert series with Cyberrock and Climate Change songs under the title ‘The Government Is Out’. “At the Spirit of Woodstock Festival 2010 in Mirapuri me and my band perform our 10 days ‘The Government Is Out’ concert series. During these concerts we present topical songs dealing with the life on our rapidly changing earth and the impact these changes have on our future. We all have to face times when we can no longer switch back the clock or overlook the facts that give a new meaning and reality to our life. We have to adapt quickly to the existential problems of risin’ food-, energy- and housing-prices, dwindling natural resources, energy wars, growing pollution, deterioration of human values, work, wages and education along with global climate change. The next future will be as good as is our present goodwill, understanding, awareness and consciousness. Michel Montecrossa, Cyberrocker and Founder of Mirapuri created more than 2200 songs and 50 symphonic compositions. The extraordinary work of Michel Montecrossa is constantly moving further. Fusion of all song-styles, symphonic music and music movies unite to form his unique Cybermusic. the following Michel Montecrossa video and tour-announcement offers groovy festival pics – enjoy! Michel Montecrossa and his band the Chosen Few this year bring to the Spirit of Woodstock Festival in Mirapuri the brand new songs of their ‘Happy Future & Climate Change Concert Tour 2010’. During the ten festival days they present a stunning concert series with Cyberrock and Climate Change songs under the title ‘The Government Is Out’. This entry was posted in Climate Song, Cyberrock, Dance, eco-musician, Electronica, Global Warming, Happy Future Climate Change Concert Tour 2010, Klimawandel Songs, Michel Montecrossa, Movie / Video, Posts, Spirit of Woodstock Festival and tagged Climate Change, free entry, Green, Italy, Lake Maggiore, Michel Montecrossa, music festival, Spirit of Woodstock. Bookmark the permalink.